Some readers have e-mailed me asking why I have been on such an Australian wine kick lately. The answer is simple...I like Australian wine. Not only do I like the Australian style, but it is one of the few countries remaining with wines that I still consider a value. I tasted over 120 wines with John Larchet, owner of "The Australian Premium Wine Collection" last month during a two day tasting. I got to spend the entire weekend with John and was thrilled to be able to taste his wines. John emphasised his love for wines that are highly aromatic. He told me he felt that when a wine smells great, there is a high probability that it will taste great too. All of the wines he imports have one thing in common. They are balanced. There is not excessive acidity, tannin, alcohol or oak. He likes to say his wines are smooth and easy drinking, with "no arms or legs" sticking out to ruin the experience. I found his wines extraordinary. All of them seemed to suit my palate. When tasting so many wines over a short period of time, you develop a shorthand while making notes. None of the shorthand is standardized. It becomes a private language that would make sense only to the taster. When reviewing my notes for the Fireblock "Old Vines" Shiraz, the first thing I read was in all capital letters. "HOME RUN". In my shorthand, it is the highest complement I can pay a wine. "HOME RUN" designates a wine that is easy to drink, has great structure, is flavorful and is considered a good value based upon price. The Fireblock "Old Vines" touched all bases. Fireblock is produced in the Clare Valley in South Australia. Bill and Noel Ireland are former wine retailers from Sydney and are the owners of the Fireblock Label. They are also partners in another wine venture in the Margaret River area called Flinders Bay. Their passion for wine is reflected in the product they produce. The parcel of land that is now the Fireblock vineyard runs along an old rail line. Initially the land was uncultivated and used to prevent fire along the rail lines. The old steam trains used to spew soot and cinder that could set wildfires along the tracks if ground was planted. Happily, the demise of steam locomotives now allows for much more efficient, and tasty, use of the land. Chenin Blanc is originally from the Loire Valley in France. Over the years, its reputation has been sullied, especially in the United States, because of its use in many low quality generic box wines. This grape is represented worldwide. In the United States it grows very well in California. Chile, Mexico, Brazil and Argentina also has a suitable climate for growing success. In South Africa where it is called "Steen", it thrives. It is often used in all of these countries to bottle as a varietal, and quite often blended to boost the acidity of Chardonnay. When Chenin Blanc is made well, it is a beautiful wine. From bone dry, to sweet dessert wine, this grape has incredible versatility. Francois Chidaine has been growing grapes and making wine most of his life. He worked side by side with his father Yves and learned bu "hands on" experience. Learning from his father, Francois still manages the vineyard using tried and true methods. "Les Argiles" refers to the water retentive clay in the vineyard where these grapes are grown. Although the vineyards are certified organic, he does not make a big deal of this fact. The old fashioned methods of viticulture still ring true for him, and in his opinion make the best wine. This 2005 vintage is luscious. It is straw colored and fragrant. Tropical pineapple, lilac, quince and grapefruit attack the nose. It is full of fruit, but beautifully balanced with acidity. It has good concentration of fruit, and has a wonderfully long finish.. This wine is almost dry. 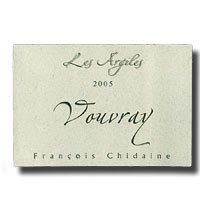 Chenin Blanc is one of the few white varietals that can be cellared. This wine should age extremely well. This wine surprised me. I did not expect I would like it this much. I thought I had been exposed to some decent Chenin Blanc in my travels, but this one has been the nicest to date. I was able to buy this wine for $22. This is a lot of wine for the money and I guarantee that the quality belies the price. This is imported by Louis Dressner out of New York. It may be a bit tough to find, but it is worth the effort. It is sold in the DC area at MacArthur's Beverage in Northwest, DC. You can also find it on-line. If you have not had a chance lately to try this varietal, do so. I think you will be pleasantly surprised with what you find.